Once Chime had been the most promising mage in the land, feted and celebrated for her potential and future role in the kingdom. Then Iris, her young competitor, made a stunning leap in skill and turned Chime's world upside down. Now no longer the most powerful, no longer promised to a prince - and still unable to harness her magic properly - Chime was set adrift. As was the new king's cousin - and former heir - Lord Muller. Yet when the neighboring kingdom threatened war, Muller and Chime were tasked with uncovering the plot. Both were flawed, yet unwilling to accept a lesser destiny than they had once known. Could this quest be the opportunity for redemption - or would it lead them to their deaths? 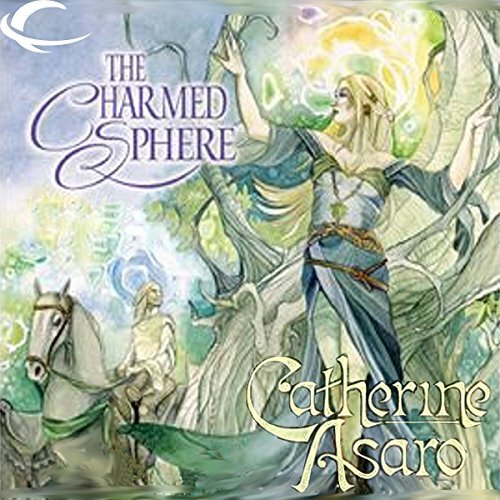 Award-winner Catherine Asaro, author of The Skolian Empire, creates her first full-length fantasy novel in a world rich with magic and power. Fans who caught a glimpse of the kingdom of Aronsdale in "Moonglow" from the Charmed Destinies collection are delighted with the result! ©2004 Catherine Asaro (P)2012 Audible, Inc. Among fantasy books in which people are born endowed with magical talent, this book takes a different angle. (Ha, get it? Angle.) Geometric objects are the key to unlocking magic in this world, and I liked the story enough to read the next book in the series. Would you try another book from Catherine Asaro and/or Melissa Hughes? This is a story about a young girl and the narrator sounds like she's sixty, with a raspy voice that does not fit the character. The editing was also horrible, with a change in point of view between one sentence and the next, but no pause in the reading--I got confused a few times as to which storyline i was following. This story line was very contrived, the main characters don't want to do things (like marry each other) and change their mind without any explanation. There isn't much depth, the female character has a revelation after being in the castle for a year that there are other countries outside hers that threaten hers, and maybe part of being queen is having to protect her country from threats. I'm not going to finish the book, I gave up 2 hours in. What didn’t you like about Melissa Hughes’s performance? Her voice is too old for the character, she shouldn't be reading young adult fiction. Usually when I pick up a book that very clearly focuses on a love story it ends up falling into horrible cliched traps that prevent them from being together. The author, seemingly fully aware of this fact loves to tease you with other novel's shortcomings. That being said its not just a cute little love story but also has a great fantasy setting. The story focuses on four youths forced into leadership while desperately trying to understand their awakening magic. This is a great light read and I will be picking up book two. It takes some time to get into it, but this is the kind of thought out fantasy writing all too rare in modern authors. The characters and world grow as you read. I'm a big fan of the magic or technology being an integral part of the story; a well thought out magic or technology platform really enhances the story. I certainly liked the shapes and colours concept. I also liked what she did with the balancing of the magical powers (no spoilers). However, there is no sense of occasion; I found myself numerous times getting half-way into a pivotal scene and having to backup to figure out just how in the world did I get hip deep into a major conflict (character or military) and miss the start of it? I suppose it could be in part due to the lack-luster narrator performance. Not a bad performance on any particular category just low to average marks in all of them (pacing, emphasis, excitement, etc.). Not what I expected out of Asaro given that I have 3 other books of hers. I just think the whole production (book and audio) really didn't come together like they thought it would. I just can get past the Narrator. She takes a lot away from the story, some of her pronounciation really annoys me. So I won t finish this book or the rest of the series. She would be better reading childrens stories. Sorry.